Sell My Car in London, Croydon. How To Sell Your Used Car in London. If you have ever thought “I want to sell my car in London” We Want Any Car can help! Our Croydon branch is located at the site of London’s first major airport. Our enthusiastic and helpful team are based in a truly modern environment within a characterful and historic listed building, boasting its own on-site coffee shop, bar and Rayon D’Or restaurant. To start the car selling process, just enter your registration number in the right hand side and click on ‘Value my car’. Fill your vehicle details into our car valuation form you and you will receive a FREE vehicle valuation. If you are happy with the valuation you can make an arrangement to come to our Croydon branch where you can sell your car to us. Our knowledgeable staff will be able to answer any questions you may have. Selling your second hand car in the Croydon area is simple, quick and hassle-free with WeWantAnyCar.com. You'll avoid the time wasters you may encounter when you try to sell your vehicle privately, and there's no need to splash out on advertising your car and waiting for the right car buyer to turn up! As well as our Croydon office, we also have branches in Staples Corner, Watford and Hounslow, among others. 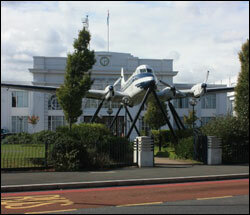 Airport House is opposite the Colonnades on Croydon's Purley Way, right next to TGi Fridays. It shouldn't be hard to find us as there is a large plane in front of our building upheld by a custom plinth. Friendly and got close to original offer. this company was very easy to deal with - so long as you are realistic about the condition and price you want for your car and be prepared to walk away - then you will have no issues dealing with the company. Easy to use website, quick simple and easy on the day to sell the vehicle. Hassle free!